Why is it so hard to accept linux? RME User Forum → Linux → Why is it so hard to accept linux? Topic: Why is it so hard to accept linux? What we as artist need is freedom to express our self. As a music os windows absolutely stinks and mac is many times to expensive. Today my setup is, a partition with Win7 for music creativity and Opensuse for absolutely everything else. Opensuse quality is like another universe compared to even old Win7 and it's up to date. In linux would you can program closed source drivers, you can use cross-platform gui's like qt, you have access to source code for free, you can contribute to the wider world by submitting a few patches with updates and bugfixes. The foundation is really there now. I am frustrated out of my mind that the pc music industry / companies hate linux that much??? I am now using more time tweaking tuning than creating music. I bought your fantastic Fireface UCX, only to discover, that Windows is just a tweak tweak tweak, study study, surf surf, tweak tweak, nightmare. This takes away the fun that we could have focusing on music creation, not windows tweaking. I have a good i7 cpu, good ram, texas instruments firewire, gold plated - oxygen free copper-cable, blood trimmed windows 7 and still this setup has problems with occasional pops and clicks. Please please please make drivers for linux including your mixer software. I would happily contribute 100€ for development. Re: Why is it so hard to accept linux? As RME would open source their drivers it would give the competition a huge advantage.. Won't happen. I think you statement is flawed. You are not forced to have opensource drivers / software for linux. There are licenses that makes commercial apps possible. Having binary drivers and Totalmix for Linux would be a very nice thing. For users it would be great to get high quality interfaces for the Linux market. And who, if not innovative companies like RME, could become a "tie breaker" to solve the "chicken and egg problem", that there will be no Linux versions of DAWs and VSTs if there are no supported recording interfaces available and vice versa ?! For RME I see the add-on value, to have "just right now" a unique feature against competitors in terms of compatibility and sustainability for users investment into their products. For users it would be nice to use RME products with high quality RME drivers and applications like Totalmix and Digicheck, as there are already some DAWs in the market (i.e. Bitwig and others). And also it would simply be nice to be able to use good RME HW under Linux for us "dual boot" people running Windows only because Cubase & Co are not available, but otherwise prefer Linux over Windows and Mac OS ..
and finally to motivate companies producing DAWs and VSTs to develop more applications for Linux as well. EDIT: for this reason I am personally stuck with Windows 7 and I invested into a normally "oversized" PC which runs Win7 simply to survive the next 5-10 years in the hope, that the situation becomes possibly better. But I have my doubts that Windows 10 will become any better in terms of privacy etc, without any pressure from the market ... And from "law" I don't expect too much in terms of privacy. Therefore I think we all sit more or less in the same boat and should work together somehow on / for alternatives. - at the end more potential to really design and fix things instead of having only to react on "others (OS) mistakes"
At the end my idea / vision is, that everybody in this market, manufacturer of recording interfaces and of applications like DAWs and VSTs would get by this a new main pillar (german: "standbein", not sure if translated correctly). Another motor might be, that in the Unix area there is still a high spirit, that people do something for free (Open Software). So I would hope for new interesting free quality Software in the Linux world. Which of course makes more sense, if you have quality interfaces as a hardware basement. RME would not need to fear having to make their sources public. Like nVidia and other companies its possible to distribute binary versions of kernel modules and applications for Linux. EDIT: To put examples of other big companies: IBM i.e. did big efforts to move from Mainframe to Linux (HW and application wise), even put Java/JBOSS based programming environments into open source (don't get me wrong, nobody expects this from RME as explained already). And now even Microsoft invests into Linux Binary compatibility for Windows 10 with Ubuntu based applications, which reminds me of the "linuxulator" in FreeBSD which exist since over 15y. Very well written. You put to words what I think most of us enthusiasts and professionals have on mind. Look at forums, even representatives of RME are telling us, we found this and that bug in Windows, have to do workarounds and get mostly ignored by Microsoft. With Linux RME could fix similar shortcomings them self. No workarounds, pure quality. If money is an issue, I challenge you at RME to make a donation fund riser for Linux support. Let us that pay for your products and by so doing support your company have a say in this matter, do not hide be honest. Then you will see if interest arises. Good idea, I would be willed to make a donation. I would also gladly donate. For way too many years I've seen the word Linux but had no clue what it was. Is it like basic was 40yrs ago, C 35 yrs ago? I'm old enough now to just sit back and use win 7. It was not until reading these posts that I had any interest. A very little bit of reading on Linux.com will give a really good argument for Linux. Oddly, linux OS is free too. Crowd funding for RME to develop Linux systems is a pretty interesting idea with wide spread possibilities. Geez, have you seen Kickstarter? Many of those ideas come to fruition with huge success. By the way: for the very reason you discuss, I had to get out of win 10 and go back to 7. Reaper has a first native release for Linux. It's a small scale test and some users were already running Reaper on Linux with Wine, but it shows others see the potential. I'd love to use RME"s hardware with Linux. RME is one of the best supported sound hardware companies on Linux and has been for many years. Just do a simple google search and you will find lots of info. There is even a TotalMix equivalent called hdspmixer ..Note, thisis equivalent to the older TotalMix and not TotalMix FX.. (as the DSP part is considered propietary)..
Harrison Mixbus and Mixbus 32C..
Latency performance on linux is generally superior to Windows. There are a range of plugins .. there are even methods to run windows VST's on Linux.. (with varying sucess)..
Just look it up guys.. Oh and it's free to use and try.. I had been looking at ffado for the RME400 a while back. The info you get is at least conflicting. Many docs aren't up-to-date. Others drivers sometimes get dropped without warning. That happened fi to the emagic devices. The firmware loader used to be in the kernel. Until some dev dropped it silently because of the license. "Update, 27 April 2012: the driver is approaching a state where it should be usable for most people now. There are a few known outstanding issues and these are being worked on (most notably, an occasional failure to cleanly start audio streaming). "Support status" has been changed to reflect this. Test reports and suggestions are welcome.". This is three years old and no follow-up. An "occasional failure to start streaming" is simply not acceptable for me. There have been some reports on the dev mailing list, but apparently, the dev has lost interest, or no longer has the device available for testing. And that kind of problem is present for most interfaces over 2 i/o. There are several devices listed as supported. When you test those, it works, but often only for 2 i/o. Again, not what I call "working". The notable exception are RME's PCI devices. These are well supported. I own a RME Fireface 800 and tried the FFADO driver for 2 years with the KXStudio distro which provides out-of-the-box a really good integration of the FFADO in Jack. The integration of Reaper was also nice (with "Play on Linux" it's easy to configure a Wine prefix only for Reaper). As cyrano wrote, FFADO and HDSPmixer are nice attempts to get the hardware working, but it does not work as good and reliable as in Windows. That's fact! Nowadays there is no more technological hurdles to make commercial software for Linux. This was THE REASON that made the development of commercial software for Linux really difficult (testing, packaging, updating, bugs fixing...). The debian packaging system is really a well designed software management (approved, secured, centralized...) but it is not "commercial friendly". Canonical has now designed the "snappy packaging system" to allow commercial developers to package their software with all the dependencies they need. Snap apps run "sandboxed" in the system and do not interfere with the current debian system. I think this is a small revolution in the Linux world. Are the people at RME aware of this?!? As someone who used Linux exclusively for everything including audio production for around 8 years, I speak from experience. It is the nature of open sourced systems that developing a common infrastructure like an audio system is very difficult. This is true because of the very freedom that is defines the open sourced system. Linux Audio is still a mess as far as I know, and this fact is the reason why it is impossible for hardware vendors to jump in. I can tell you a very simple thing that every OSX/Windows user takes for granted, but which is impossible to do in Linux. I have UFX and use it for all audio reproduction in stereo. I have Windows 10. I have system sounds going to a default output, say 5+6, and after booting the computer everything works: the RME driver works, the sound from youtube, vlc, foobar2000 and from Cubase all go to the output I wanted. In Linux, to do this I have to: 1. start jackd 2. start (if not autostarted) a pulseaudio-jack bridge 3. reroute audio to the output of my choosing. For the digital audio cards of the DIGI and Hammerfall Series are different drivers for Linux and similar OS available. Please note, RME will not deliver phone or email support for this 3rd party drivers. ALSA is not RME. It works with Windows cause it's supported by RME for Windows. It's a lot to ask for when everything RME is over $1000 minimum and then try to see if it works with our Linux PCs because some ALSA dev might have had time to test it for awhile. You'd probably see more RME products in our Linux PCs if it was officially supported by RME but the price is not worth the risk to see if it might work especially if you might not be able to return it (Sweetwater). a little offtopic, why not just make Hackintosh and run OSX if you're so much against Windows ? TMFX is the only reason that I am still using Windows (10). I would definitely support a kickstarter campaign (or similar) if RME decided to support Linux. Reaper runs natively on Linux, even on something as puny as a Raspberry Pi. Unsupported atm. So who needs Protools or Cubase? Of course, that doesn't give you all plugins on the market, but the included plugins work perfectly. And you can also run Reaper under Wine, if you are so inclined. People who would like to use Linux and want the DAW of their choice. You can't expect that everybody runs reaper. Well, you also have Harrison Mixbus, which is as good a DAW as any I've ever used. It is made to run on linux, and is being ported over to OSX and Windows. It is rock solid. Harrison also sells their console effects and EQ/comp as plugins i Mixbus (as their consoles use linux systems). Rock solid and great sounding system! Reaper is slowly coming along as well. Hopefully the future is bright for Linux, and I do hope that RME will consider supporting Linux with a port of TotalMix. There is probably not enough of a market for Linux still I wonder if there is a way to quantify this for RME, or competitors that want to support Linux. I just bought a Babyface Pro, and I only did so because it is quality hardware that works in CC mode on Linux. I only use Linux so the RME software is worthless to me. > I only use Linux so the RME software is worthless to me. Thats currently true for every other vendor, with Linux you are in a niche market in regards to recording. "As RME would open source their drivers it would give the competition a huge advantage.. Won't happen." The driver has little commercial significance. The code that gives a manufacturer like RME an edge runs on the FPGA, and would not need to be released to anyone. I think RME are hiding behind a specious argument to cover up the fact that they do not think it is worth their while putting any effort into supporting Linux. It would be so wonderful if RME broke the ice like some German VST developers [u-he] and make drivers and DigiCheck for Linux in the future! The number of people who use or would like to use Linux is growing daily and soon we will be in numbers that are hard to ignore. Currently I use Linux for everything but audio, because it's just easier and there is more audio software available [read: I invested in many plugins and programs that are incompatible with Linux]. I've tested different version of Windows [XP, XP64, W7SP1, W8.1, W10] on my AMD 4-core, and my Intel 4-core laptop, and since XP audio performance with ASIO and VST DSP processing is just going downwards up to 20%! Don't believe the Microsoft "sponsored" [paid] articles on the web, even the well known [or especially!] audio website ones. They sing as Microsoft plays, and gullible people believe it. And btw. Microsoft couldn't care less about the professional audio users as we are just a couple of percent of all Windows users. Nowadays it's most practical to use W7SP1 for audio even though it performs a little worse than XP/XP64. But nothing would beat a custom Linux installation with RT kernel for audio and an RME card. I would so love to see that happen! Probably the OS is still overrated at the moment, but the need to become independent from Microsoft or Apple has nothing to do with 'geekiness'. The direction these operation systems take is getting in the way of building a simple, stable music production system. Some might prefer having their digital social network right next to their DAW to share their freshly produced music, but when a professional is recording a concert he doesn't want to have all sorts of messages popping up all the time, for example. At the moment it might still be possible to tweak a system so that it works somehow reliably, but as the big 2 OSs seem to mainly focus on stuff that has nothing to do with pro work i bet it will get worse. I would think it has more to do with market share. Until more average Joes go to Best Buy and buy a Linux computer so there is a substantial market for vendors to sell products to developers are not going to spend resources producing and supporting applications. Felt 200+ distributions are hard to support and are not an alternative to Windows or Apple. Look what happens last recently in terms of steam and its games / applications. Steam created a Linux distribution of their own. Surely its this way better for them to support it. in Unices like BSD, SYSV R4, etc ..
From the perspective of a single open source application this might be bareable, as you will always find people to maintain "prominent" applications or tools and to package them . But if a company is commercially settled in the Windows or Apple area then its already hard to keep things going as there are already many changes going on in the OS of main players. Having to support the Linux area additionally might be extremely challenging. 1st of all in terms of getting drivers and applications ported to the OS. Next in regards to the fact, that there are only few open source applications to act as DAW. how to install, configure maintain drivers and applications on their flavour of Linux. A better approach: move to one representative version of linux. Create diversity (Basaar ...) by only application installation packages, not by creating more distributions. This would be a much better basement to ask companies for Linux support. Besides of this there is still this chicken and egg problem, which can only be solved by mutual trust. No audio products (DAWs / VSTs) without Hardware and drivers (i.e. for recording interfaces) and vice versa. into too many distributions causing a support nightmare. One of the basic principles of Unix was KISS .. keep it small and simple. But its not simply to have too many distributions with too much diversity. In most cases its seems to be driven only by the ego of some people to create "their" Linux distribtion. Id bet on android before linux. I made some simple recordings with my fanless android box using m-audio 2x2 via usb-c port. I tried hdsp cards on linux and work fine with ada8000 but linux has energy issues and fans run on high rpm making lot of noise and make a bad fanless OS choice. Not to mention poor daw choices and utterly complex routing with Jack and alsa tools. For me, linux for audio recording and processing is a closed chapter. So is OSX, both are very inefficient in using hardware power, run redundant stuff, for my off network audio racks and don't like to use fanned video cards on board audio.. I transfer files with esata. I am stuck with windows 7 and XP for many reasons but I am looking into Android as a possibly more efficient alternative. I converted my old mac pros to windows 7 using bootcamp drivers, but still noisy. lol before linux or android (probably never happen) but it would be nice to have a proper windows 10 4k touchscreen slick app version or win 10 app frontend of totalmix, would love to have it on my surface pro4, with daw running on extension screen when mobile its nice now, but with touchpad only, too fiddly and small for touchscreen. [...] For me, linux for audio recording and processing is a closed chapter. So is OSX, both are very inefficient in using hardware power, run redundant stuff, for my off network audio racks and don't like to use fanned video cards on board audio.. I transfer files with esata. with all these instand updates .. Its by this too much of a moving target. Most concerned I am about privacy. An operating system shall be a secure, reliable, performant, well tested workhorse. Currently it mutates to kind of a service which you do not really own anymore as administrator. many sound engineers and musicians ask me "what about Linux", they're frustrated with Mac (I just know one person using Windows, closing OSX chapter). When I tell them I never had any crash or glitch in live performance or during recording sessions since more than five years (especially with my Multiface), that I can work with very low latency and hi res/sampling, I can interconnect all my softwares, I show them all the tools and utilities I have, they turn very enthusiastic. Then when I tell them their audio interface probably won't work, nor their very expensive plugins, they change the subject. Maybe RME or other could choose one, and focus drivers and support development for that particular one (i.e. Debian covers most of popular sub-distros). Linux-ALSA philosophy is to integrate drivers, so it becomes easy for most compatible hardware: plug, and play. Debian would be a good candidate because they implement changes very careful. This would be a plus in terms of not too many changes of the system. Another good candidate could be RedHat, as you can get commercial support for this Linux. support for JBOSS and Veritas shared file system. Not that you need that for your recording workstation. by side with Sun servers. Not sure whether RedHat would/could give support for a typical end user who has "felt factor 100"
RME would like to thank Mr. Winfried Ritsch from the Institut für elektronische Musik (IEM), Graz (Institute for electronic music.) He convinced us that ALSA has a future and wrote a native (non-ALSA) version of the driver. We would also like to thank Mr. Paul Davis, who implemented an ALSA version of the driver in an olympic-record-like short time. Mr. Davis is also available for questions regarding the use of the Hammerfall ALSA driver under Linux. I remember the old Hammerfall linux driver pretty well. Back then I had a couple Digifaces. The driver had a GUI too; the 'matrix editor.' Good stuff! Since then, I bought a Fireface UFX to use with Linux via USB2, class compliant mode. During this time, I've reached out to RME support a few times to request a Firewire driver--quite a shame I cannot take advantage of Firewire, having spent 2 grand back when. I still have hope though. I think eventually there will be enough commercial motivation to do so. We shall see. In any event, I will never run Windows or Mac again; I'm done with their spying, disrespect and all-around abuse. Isn't XMOS doing a good job with their free USB Audio Device Class 2.0 driver? I really don't get the whole proprietary driver thing.. I understand Windows might need it but let's say you build a soundcard targeted for Linux and Mac, I see absolutely no need for custom drivers. Just expose everything the way it was designed with audio device class. In case the hardware needs additional things, I think a composite device with a CDC with an open protocol on the side is way to go. If you want Linux and you want an RME digital audio interface, then you might try scrounging some old RME PCI cards, either DIGI9636 or DIGI9632, and use the suitable driver at the link below. Add some AD/DA with ADAT, which can be RME or something other than RME. If you do not have PCI slots on your new motherboard, then you might add some PCI slots with bridge and backplane. I know that the hardware is available at moderate cost, but I have no idea how well that might work with those RME PCI cards. RME's HDSP hardware is a little newer than RME's DIGI9636 amd DIGI9652. Here is a link to a Linux Journal article on, "Using the Hammerfall HDSP". Another possibility might be to use a Dante network interface on the Linux box, and use a freestanding RME Digiface Dante to bridge RME MADI gear to the Dante network. A multiboot box that boots Linux, or boots in Win7 and/or Win10 could be used, using Win7 or Win10 to configure the Digiface Dante, then rebooting in Linux for using the Linux-based DAW while using the Digiface Dante as a freestanding device. A Google websearch on "Linux Dante" turned up a Dante PCIe card which puportedly includes a Linux ALSA driver, providing Linux compatibility. Related information including the URL is in the quoted section below. This is not SPAM. I have no affiliation or experience with product or seller. The Dante PCIe card Astoria is a high capacity Dante PCI Express card for PC, Mac or Linux. Astoria provides 128 input and 128 output channels of uncompressed digital audio with extremely low latency. Astoria can support configurations for 128 × 128 bi-directional channels at either 48 kHz or 96 kHz sample rates, or 64 × 64 bi-directional channels at 192 kHz sampling. Astoria can be installed on both Mac and Windows, presenting a standard Core Audio or ASIO interface for immediate use with audio applications. It works over standard Gigabit network and is AVB-ready. Four Audio additionally provides a Linux ALSA driver as a binary module that brings 128 in- and outputs to Linux machines for a wide range of kernel versions. Onboard processing frees your computer’s resources for native DSP and plug-ins. Audinate’s patented Dante solution provides a no-hassle, self-configuring, plug-and-play digital audio network that uses standard Internet Protocols. Astoria Dante PCIe card is not new, rather was introduced by Audinate in 2010 and is one of their products that they sell to OEMs. Las Vegas, NV June 10, 2010 --At infoComm 2010 today, Audinate launched its new IP based Dante audio networking PCI Express sound card. The Dante PCIe Soundcard unlocks your recording and production potential by providing 256 channels of uncompressed, digital audio with astoundingly low latency. The high capacity Dante PCI Express Soundcard for PC or Mac provides a cost effective solution for OEMs seeking to create high performance recording and audio processing products. The Dante PCIe Soundcard provides an unprecedented number of super low-latency Dante audio channels with support for all popular sample rates. Onboard processing frees your computer's resources for native DSP and plug-ins. 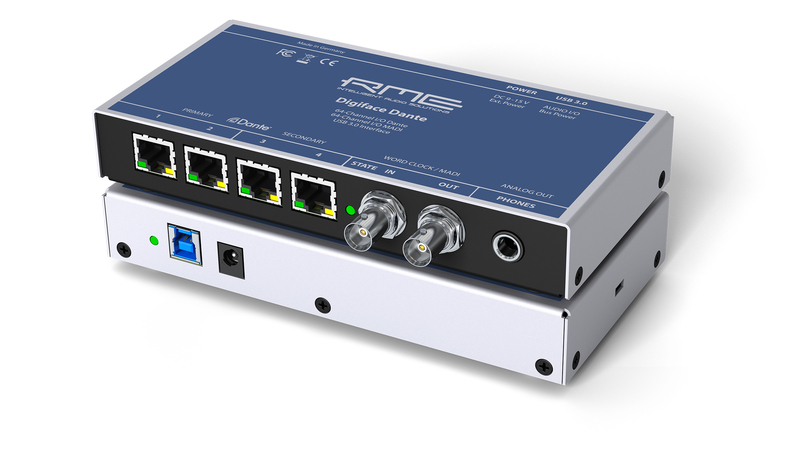 The Dante PCIe Soundcard can support configurations for 128x128 bi-directional channels at either 48 kHz or 96kHz sample rates, or 64x64 bi-directional channels at 192kHz sampling. The new soundcard can be installed on both Mac and Windows, presenting a standard Core Audio or ASIO interface for immediate use with hundreds of professional and consumer audio applications. Astoria works over standard Gigabit network and is AVB-ready. Audinate’s patented Dante solution provides a no-hassle, self-configuring, plug-and-play digital audio network that uses standard Internet Protocols. The Dante PCIe Soundcard will be sold to OEMs as part of their overall Dante networked solution. About Audinate Audinate revolutionizes the way that AV systems are connected by transporting high-quality media over standard IT networks. Using Audinate's patented networking solution, digital media networking just got easy. Audinate’s solution has been licensed by customers across the AV industry and can be found in installations and live sound applications globally. Audinate is a Promoter Member of the AVnu Alliance™. Audinate offices are located in US and Australia. PICe cards are also usable, HDPSe works too (AIO, RayDAT, MADI...). Or all the USB interfaces operating in class-compliant mode. But you can't update firmware on any of them, internal PCI / PCIe cards including. USB is slow for performance. RME, what do want to start consider making official Linux firmware/drivers? $10'000? $100'000? $1'000'000? Please give us anything to go on!